This tour is to be run for a third year, so positive was the response of travellers. Our tour will discover the architectural gems of ancient Greece and facets of the 2,300-year Jewish existence within Greek culture. 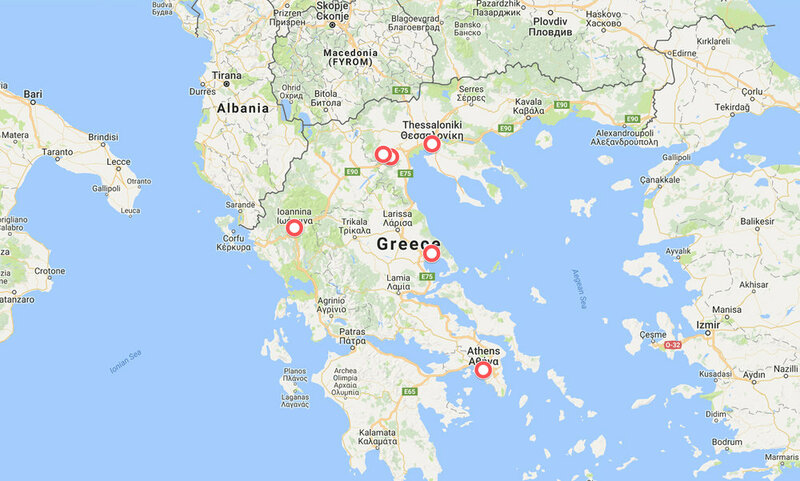 The tour begins in Thessaloniki, a port that is not usually on the tourist map but which JR's 2016 & 2017 tours found fascinating. The city was once 75% Jewish. The tour continues through beautiful scenery, stopping to see the wonderfully preserved tombs of Alexander the Great’s family in Vergina, synagogues in Veria, Ioannina and Volos, and the monasteries atop amazing rock formations in Meteora, to Athens, with its classical wonders and a warm welcome from the Jewish community. Arrival at 10pm (Ryanair leaving 4.20pm from Stansted) at Thessaloniki airport where we meet with guide Vivi Aslanidou who on the way to our hotel gives an overview of the city and its Jewish history. We check in to the Hotel Mediterranean Palace, which is in a central position and close to the sea. Plenty of good restaurants nearby stay open late if you wish to eat. In the morning there is a Jewish walking tour, visiting the Square of Jewish Martyrs and the ceremonial Synagogue Lezikaron followed by a presentation at the Jewish Museum where we learn about a community that once had 50 synagogues and was called Mother of Israel, home to famous Jewish mystics, legalists, poets and rabbis. Our coach takes us to quarters of the city that were once wholly Jewish and to archaeological sites going back to Roman and Hellenic times, villas once inhabited by prominent Jewish residents and the new Holocaust Memorial on the site of the cemetery destroyed by the Nazis, now the Aristotle University campus. We return to our hotel in time to freshen up and, for those who wish, to walk to the Monastiriot Synagogue for Shabbat prayers. Then we enjoy a Shabbat kosher meal, hosted by the entertaining Rabbi Joel Kaplan at the nearby Astoria Hotel. Optional synagogue service followed by a sit-down Kiddush with the rabbi. Others might like to wander along the promenade of the port, just over the road from our hotel, or along the shopping streets nearby, or visit the very good Museum of Contemporary Art close to the Museum of Byzantine Culture, where a light lunch can be bought in a courtyard café. At 2pm we meet Vivi for a visit to the Archaeological Museum and the famous landmark, the Rotunda, close to each other and the wonderful promenade from which you can take a boat trip if you wish at the end of the tour. Dinner at Palati Taverna, a short walk from our hotel, with traditional Greek music. We head for Vergina where the unearthing in 1977 of the richly extravagant tombs of King Phillip 11, father of Alexander the Great, became as famous as the Dead Sea Scrolls. 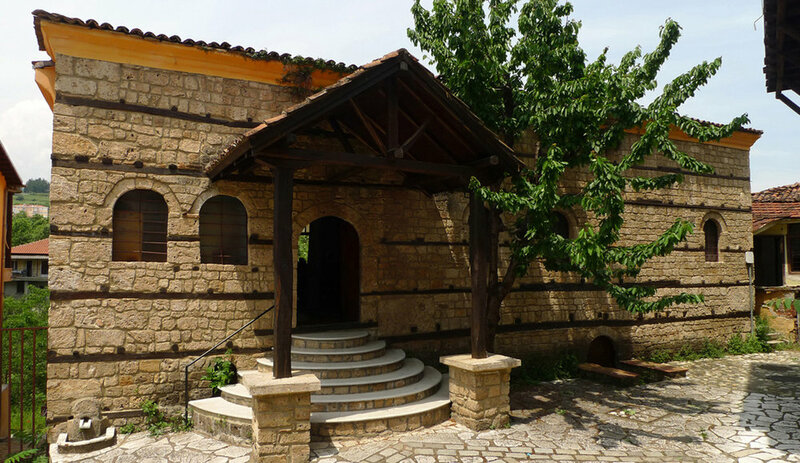 We continue to Veria where we hear about the town’s rich Christian heritage and absorb its Jewish quarter with its unique setting and the atmosphere that still prevails at the natural river mikva. We spend time learning about the community of 900 who perished from caretaker Evi Meska in a beautifully preserved renovated synagogue that she looks after with consuming passion. We stay at the Aeges Melathron Hotel in Veria. We leave Veria for a three-hour drive to Ioannina where we have a group lunch under the grand arches of the Stoa Louli restaurant, once a trade centre for Jewish leather merchants. Inside the castle we stroll through the ancient cobbled streets of the former Jewish Kastro quarter and visit the Romaniot Kal Kadosh Yashan Synagogue where we are shown its unique artefacts by Allegra Matsa who, with eloquence and passion, tells us about the history of her community and its current members. She also shows us around the medieval Jewish cemetery which is in a forest. We also have time to walk around the city’s beautiful lake or take a coffee at the lakeside before driving to the Epirus Palace Hotel. We have a picturesque drive to the Enesco Meteora site of the famous 14th century Byzantine monasteries, suspended on granite rocks. As well as marvelling at the views we visit two of the monasteries. We stop for lunch at Kalambaka and dine and stay at the Amalia Hotel. We set off for Volos which is surrounded by beautiful mountains and looks out on a charming bay. We have a group lunch at an excellent restaurant on the promenade and have time to stroll by the water’s edge. We then walk to a Holocaust memorial and through the Jewish neighbourhood to the Synagogue and community centre and learn about a community that dates back to the 6th century and still has weekly services. We dine and spend the night at the lovely shoreside Domotel Xenia. We leave Volos to head for Athens. We arrive late afternoon for a tour of the Acropolis, when most tourist groups have departed and the sun has passed its hottest. There is also time for our bus to tour the other remarkable sites of the city, Constitution Square with its picturesque guards, the Temple of Olympian Zeus, Hadrian's Arch, the Theatre of Dionysus and the Olympic stadium. We check in to the boutique Pallas Athena hotel where we have our final group meal. Check out from hotel for those leaving on Friday. We see the Beth Shalom Sephardic Synagogue and the Romaniot Synagogue just opposite. Then we visit the Jewish Museum, welcomed by outstanding director, Zanet Battinou (see JR July 2018 issue) and curator, Anastasia Loudarou, who lead us through their excellent exhibits, enhancing our understanding of Greek Jewish history. The tour formally ends in time for late afternoon homeward flights. Main Tour The cost is £1,695.00 per person sharing a double or twin room to include seven evening meals and one lunch, all transport within Greece, guides and museum fees. The single supplement is £495. International flights are arranged and paid for by participants. Please wait until your tour is confirmed before booking. Extending Your Stay Those who wish to stay in Athens on Friday and Saturday nights might like to move to the Jason Inn near the synagogue and book Shabbat meals at the Chabad Gostijo restaurant. We will contact the synagogue for security clearance for attending services but travellers make bookings for meals and hotels independently. This tour is for Jewish Renaissance subscribers only, so if you are not already a subscriber you will need a subscription – click here to subscribe. There will be a briefing meeting before the trip with a chance to meet your travelling companions and ask any questions you have from our guide, over a Skype link. If you are interested in joining this trip please email janet@jewishrenaissance.org.uk. The trip is organised in association with West End Travel.